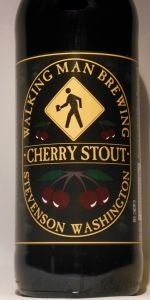 Cherry Stout | Walking Man Brewing Co. Served in straight pint glass. Poured a rich, deep black color with (surprisingly) just a thin cap of tan head that had no retention and a bare trace of lacing. The expected roasty stout aromas were nicely accented by the scent of dark cherry. The flavors followed along as expected, with the cherry complimenting the the base beer nicely. The body was a thick, but not heavy, treat. A very drinkable beer for being so big. Worth seeking out. Had this on tap at Horse Brass. When the waitress said this beer had an aromatic cherry presence, she was right. When she said it didn't have the strong or sweet of a cherry flavor, she was really, really wrong. The pint arrived quickly, and appeared rather attractive. A deep, almost dirty brown with a mild tan foam capping the top. It appeared to be moderately carbonated. The aroma was startling, and should have served as a warning. There was little beer to waft over the sharp aroma of cough syrup. The taste was wretched. It was like the cherry concentrate had all been poured into my glass, but also mixed with anti-freeze. It was nearly impossible to recognize the beverage as a beer due to the acrid taste. I actually like syrupy fruit flavors, but this was horrible. After 4 sips on my own and a second opinion from my wife, I ordered another beer. Thank god for Racer 5. Black Cherry Stout was served at the Walking Man Brewpub. The beer was black in color and came with a thin dark tan head. Dark cherry accents peeked through at the edges of the glass. The nose was absolutely beeming with wonderful notes of creamy sasparilla, focused cherry, and fresh vanilla....promising of good things to come. On the palate, flavors of black cherry swirled with tasty notes of chocolate and creamy nutty coffee. The beer seemed to release even more dark estery aromatics while drinking it (picked up though retro-olfaction) than smelling it directly. A chocolate-roasty sharpness developed after the initial hit of flavor, leading into a smooth roasted dry cocoa finish that left lingering mildly bitter cherry essence...with almost porter-like qualities. Beautiful flow of flavor...with balance and moderation. The body was superbly composed for the flavors and character of this beer. A wonderfully crafted stout with flair. On tap at Henry's in Portland. This is an after dinner stout because the cherry taste and nose is quite strong in fact it smells like chocolate covered maraschinos. The beer is smooth and well made but the cherry notes can become at little much after awhile. Pairs well with desserts. Mmm, mmm. Found this on one of the guest taps at the Horse Brass. Pours jet black with a small, coffee-colored head. Poured a little cold, but aroma is still a nice blend of dark cherries and a hint of chocolate. Wonderful creamy mouthfeel holds a nice, deep malty base with a background of cherries, dark chocolate, and a touch of molasses. Probably the best stout I've had in years. It definitely had a pronounced black cherry flavor but I did not find it syrupy, I actually found it to be a bit thin for a stout, maybe even a bit closer to a heavy porter in consistency. The chocolate malt mixed nicely with the cherry flavor, tasty and not overpowering. It was also fairly well carbonated with a good-sized head, I guess they could have turned up the gas (?) As with all fruity beers it's probably too sweet to lend itself to repetitive drinking but it's worth a couple pints for sure. Well, I had my share of great craft brew on my recent Oregon trip, but I'll start with the bad. I'd heard so much about Walking Man, and on a visit to the famous Horse Brass in Portland I was excited to see this and the Homo Erectus IPA on draft. I asked for the latter first, but they were out, so settled on this as a dessert later. While this beer looks nice, and smells like a nice chocolate-covered cherry, the taste is syrupy and gross, like cherry cough syrup. This needs much more roastiness from the malt and perhaps more hopping to balance out the cloying sweetness. Mouthfeel was fine, and drinkability can only be classified as "difficult." Quite shocking, as I really like the other Cherry Stout I've tried, from Kalamazoo. I will seek out more Walking Man brews in the future, as I hear their expertise is in their use of hops -- but I will not be trying this again. I'd like to suggest that maybe the Horse Brass isn't keeping this in top shape, as the other really negative review was from a pint poured here. I chose a pint of this fruited stout for dessert after a healthy serving of Walking Man's famous pizza. That proved to be a good choice, and I was rewarded with a strong dark ale bursting with black cherry flavor. The aroma was particularly striking in this regard. Walking Man's menu claims this beer "tastes like Black Forest cake." They make a good point here, for the black cherries are all over this beer. They are co-stars, not walk-ons, and the flourish of chocolate flavor from the stout base delivers a well-composed complement. The stout elements are ultimately subservient to the fruit, but serve as a sound counterpoint. I was prepared to dislike this beer, for the concept at first struck me as a bit of a stretch. I just wasn't convinced that a cherry stout was going to work. But it did. It worked quite well, though I've also had this beer at pubs in Portland when its freshness was not assured and it didn't resonate nearly as favorably on those occasions. I was tempted for a moment to compare the taste to flavored cough syrup, but that would just be my mind running away with me, making comparisons because it can. The truth of it is, this beer, when fresh, is a hearty flavorful ale that works well for dessert or anytime you might care for dark, fruity ale. Had on-tap at the Horse Brass Pub in Portland, OR. Hugh, the bartender told me it's "sweet, but we sell a whole lot of it..."
The first signs are good for me, despite the skeptical tones in Hugh's voice: gorgeous deep black body, with a creamy head of mocha-brown. Lace is fine, but consistent and persistent, leaving wonderful lace. It looks so good, I feel as though it might be a nitro pour. Not sure, though. Nose is: BIG. Black cherry comes through strongly, giving a refreshing medicinal hint with its poignant biting fruit, above the deep dark maltiness that sits like heavily stewed mudcake underneath. Other notes crop up with marzipan, powdered sugar and fruit compote. Wow. This is an incredible smelling beer. I really love it. Taste is lighter, but still very good. Smooth, roasty entry that never lets up on the sweetness, with an upswell of black cherry and a mild phenolic medicinal bite. Back palate has bitter almonds, smooth, pithy fruit and a caressing dryness that wraps everything up while still allowing it to express itself. Lovely. Feel is smooth, but allows a tingle from the cherry to come through. Overall, I'm wowed. This is amazingly good stuff. I'm a fan of the judicious addition of fruit to stouts, and this is a great example of it. It's drinkable and smooth, but really interesting and complex. I just love it to bits. I heard a while back that this beer was born of a bet/joke. It turned out so well that it's been a regular in Walking Man's lineup ever since. And yes, this beer is anything but a joke. Pours like motor oil and settles with a lovely brown head. Black cherries burst into the nose along with hints of mesquite smoke and espresso. Black Cherry shows up right off the bat and mingles with chocolate and coffee. Somehow I even taste some banana. Finish is full of coffee bitterness and cherry. Mouth is medium, which definitely promotes sessionability despite the 7.20 ABV. This is a wonderful fruit beer that I never hesitate to order when I see it on tap. This pours a dark black that lets no light through. A deep brown lacy head stays for a bit and then drops. The cherry smell is followed by deep chocolate malt. This has a fairly heavy aroma once it warms up form the tap. It has a big taste. Chocolate covered cherries. It hit sweet and hard. Then just stays and stays. This gives way to a light bitterness. This is an after dinner beer to be sipped like a fine port. I let this warm up and finish a session. Room temp is great. Take a growler of this home with you. Black as I've seen. Midnight is commonly used for the depth of this beer. Absolutely opaque and blackhole like but no head and very still. What a nose. Thick with ripe black cherries covered in dark chocolate. Very in your face with a perceived sweetness. Silky smooth creamy mouthfeel. Nice bitterness with a thick black cherry middle. Very bitter cocoa thoughout the entire palate but it basically ends there. A good approach that is just barely missing something and things become a little cloying after half a pint. I had this beer on tap at Rose & Raindrop in Portland, OR on a perfectly rainy, miserable Sunday in October. Imperial pint glass pour. A: Jet black stout with a spongy/creamy 1-1/2 finger high tan head. Clumpy but consistent lacing. S: MMM...cherries! Rich ripe cherries, very juicy. The smell wafted from the glass when it arrived. Whenever it subsided, I'd agitate the glass some more and let that sweet smell rise again. Wonderful, I didn't find it to be 'artificial' or 'medician' smelling at all. Yum. T: Hmmm...not quite as good as I'd hoped for. Cherry flavor is pretty subdued. A robust, moderately bitter stout, with flavors of dark roasted malt, citrus hops and coffe beans is what I get. Mild cherry/fruit in the finish with a light sourness and some alcohol warmth. M: Chewy and full mouthfeel. Fairly heavily carbonated, so the flavors that linger seem to cling and tingle a little. D: Likable, bordering on lovable. I enjoy the bold beers that Walking Man brews - this is a nice example of a well-crafted, interesting stout from what is one of the NW's top breweries IMO. Not my favorite from their line-up, but definitely not one to be missed either. Absolutely worthy of a try. This beer is dark brown mahogany color with a very dark tan head that had little retention and light lacing. The smell is nothing but artificial cherry candy odors. The taste is very reminiscent of several cherry cough syrups. There is unfortunately so much cherry here, few of the standard stout tastes can escape its gravitation pull. The finish is medium length and somewhat lingering in aftertaste. There is a puckering tannic effect on the sides of the mouth. Not very drinkable, a bit of a novelty in my opinion. However, as far as being fruit beers go, this should rank amongst the better ones. Had this on draft at Henry's in Portland, the appearance is pretty strait forward stout, a thick tan head that left a bit of lace, paired with a very deep, dark chocolate colored brew. Smell was very appetizing, a rich sour cherry with a bit of roasted malt. Taste was not nearly as robust, pretty much just a strong stout, a nice bit of burnt malt and coffee, coupled with a nice tartness from the cherry, but not nearly as rich and complex as the aroma had me expecting. Mouthfeel was very rich and creamy, medium body. Drinkablity was fine as far as stouts go, stronger then you might realize, but not something I couldn't put down (or would want a second pint of). Somehow, it didn't quite seem to all come together, I'll have to revisit this beer in the future, perhaps bottled. D: a good solid brew. Flavors (malts and cherries) are well balanced and keep things interesting on an average level. Not bad! Ah, my first Walking Man beer. I was hoping it'd be Homo Erectus, but this will do. Pours black with a robust dark brown head. Very attractive beer. Smells like roasted malt and cherries. Wow. This must be one of the strongest fruit aromas I can recall, and from a stout, that's remarkable. And not necessarily a positive. ONe note, sweet cherries predominate. Some medicinal/cough syrup component(s) to it. Taste is just overwhelming sweet, syrupy cherries overlaid on maybe a bit of dark, roasted malt. Ugh. A chore to drink. Attractive, with a nice viscous mouthfeel, but the cherries are too much. Served on tap at Walking Man. Very dark beer, small, short lasting head. First smell was cherries, cherries, and chocolate. First taste I was blown away. This is the first fruit stout I've had. I know, not too much experience in this area, but what a way to start it off! I was amazed at how smooth it was. Goes down like heavy whipping cream (yes, I've drank it plain before!). Don't know if the beer travels well, but fresh on tap is incredible. On tap at Bailey's Taproom PDX 9.4.2010, $2.50 for 10 oz. glass. 3/4 finger tan head, medium-slow dissipation, some lacing retained. Dark brown, almost black opaque body, no visible carbonation. Pick up the cherries right away in the nose, subsumes all other aromas, a bit on the sweet side, an interesting smelling beer. Cherries also dominate the taste, but there is some roasted malt and grassy hops to provide a semblance of balance, but certainly on the sweet side. Mouthfeel is a bit sticky and boozy with a distinctly dry finish. Not sure how sessionable this is at this ABV, once again on the sweet side, but it was tasty. Poured pitch black with a small brown head. Nose is dark cherries and a hint of chocolate. Taste is creamy mouthfeel, chocolate with black and red cherries coming on midway and finishig up on the end. Extremely tasty and oh so drinkable. Perhaos one stout that has made me say WOW in quite some time.NW does it best. Cherry Stout from Walking Man Brewing Co.